The Ohio State University Department of Animal Sciences has a focus unique among animal science departments at other institutions across the United States. The traditional research areas in food and fiber are well represented along with more recent concerns surrounding the environment and bio-based technologies. As you peruse our research areas (click on links at left), you will notice some trends in our scholarly programs, as illustrated below. Research programs span species while fitting well within the College of Food, Agricultural, and Environmental Sciences' three Signature Areas. In addition, encompassing topics like animal health and well-being are considerations in most of the projects. 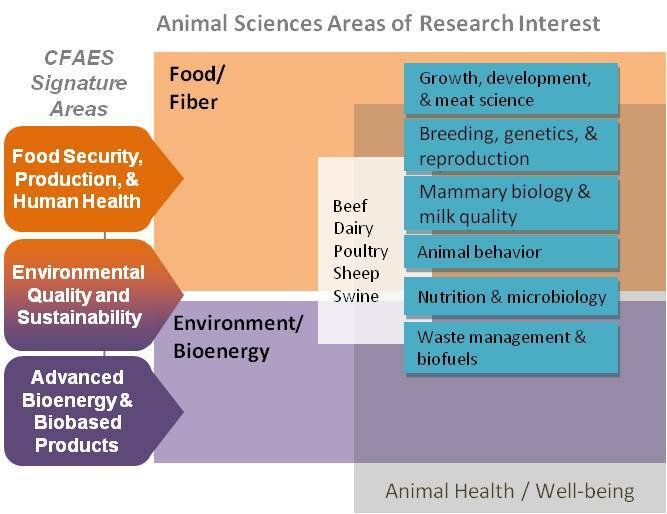 The Department’s research programs represent a broad view of animal agriculture and animal roles in society. Faculty members are constantly challenged to grow their scholarly expertise while responding to the changing needs of stakeholders. Read more about research areas from the list at left. Many faculty members have close relationships with the OSU College of Veterinary Medicine’s Departments of Veterinary Preventive Medicine and Veterinary Clinical Sciences. The Department also has close ties with the Human Nutrition Program in the College of Education and Human Ecology, including the inter-disciplinary PhD program, Ohio State University Nutrition (OSUN). Involvement is also represented in the Environmental Sciences Graduate Program (ESGP). Additionally, a number of Animal Sciences faculty members are members of the Food Innovation Center (FIC), which was created by The Ohio State University Office of Academic Affairs and Office of Research to encourage trans-institutional and inter-disciplinary scholarship across campus to address issues and problems of global dimension. The Department of Animal Sciences encourages and supports undergradaute research projects. Learn more about animal sciences undergraduate research by clicking here. Click here for the Ohio State Undergraduate Research Office.